P.S. I know the photos are truly mesmerizing but do not miss the videos at the end of the blog post… they are mind blowing! Sabyasachi Mukherjee is the quintessential man behind the showcasing of vintage and old world charm through his fabrics. His collaborations with the pioneers in the industry have been there and have carved their own novelties. Each collaboration tells a story whether unraveling the heritage of the country or related to the art. 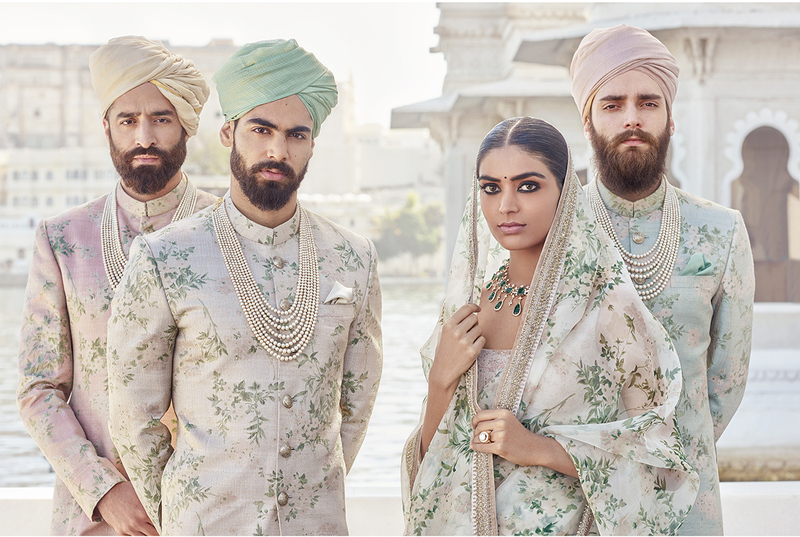 Sabyasachi’s aspirations to convert India’s rich tradition, culture and history to an aesthetically inspirational global conversation is reflected through his collaboration with one and a half century old brand- Kishandas and Company and their bridal couture offerings. Started as a jeweller to the Nizam of Hyderabad, who was known for his discerning taste, the level of excellence in the craftsmanship by Kishandas is beyond precision. Sabyasachi and Kishandas & Co. collaborations are like whimsical fantasies, built on stories of craft and history. 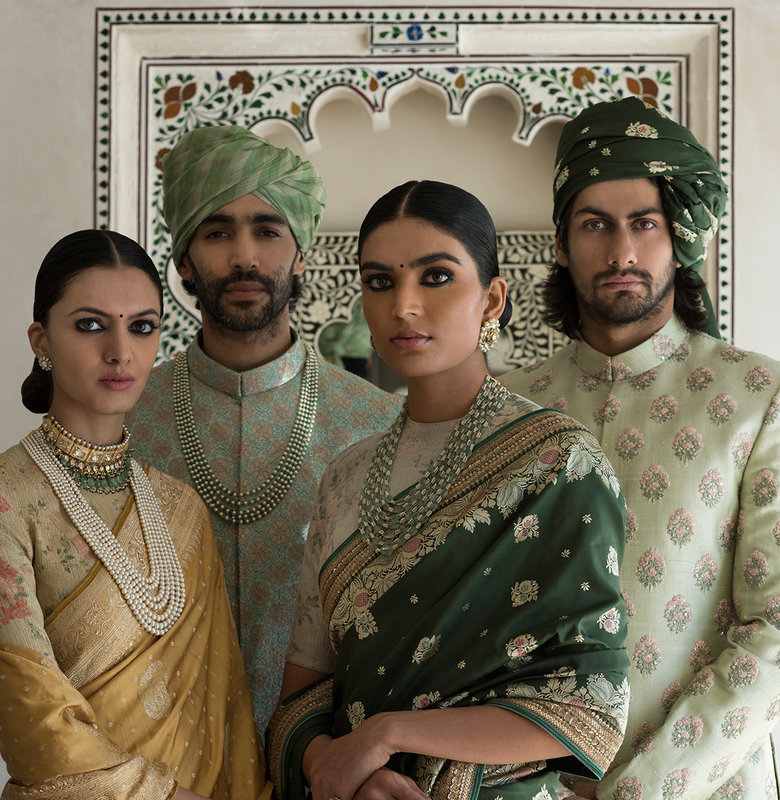 Lately, Sabyasachi focus has shifted greatly on social media as a strategy and Firdaus was the first Sabyasachi collection to be unveiled exclusively on Instagram followed by the latest Udaipur Spring Couture ‘17 Collection. On both occasions, one saw model brides and grooms adorned in layers of Kishandas Jewellery. Inspired by the rich Indian Nawabi heritage, the jewellery focuses on precious gemstones intricately crafted as separates that can be paired with a variety of apparel. 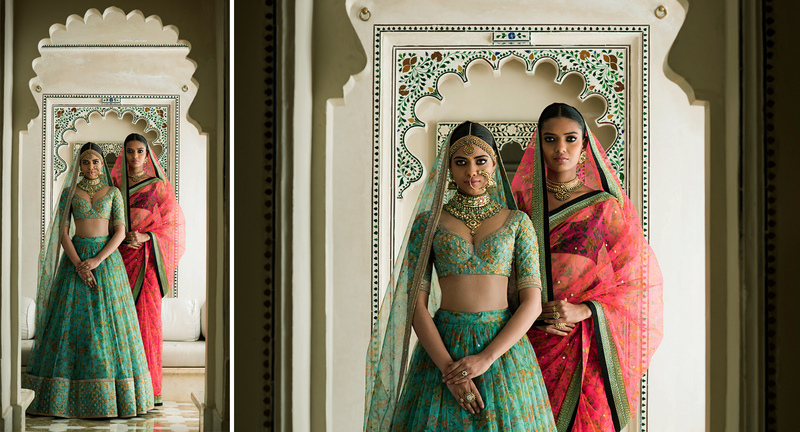 Inspired by various elements of Udaipur like birds, flowers and architecture, the elegant bridal ensembles have been intertwined to narrate their own royal story. From chic to royal grace, the charm of the regal era has been carefully integrated in the statement jewellery to romance the contemporary bride and her groom. The beautiful interlacing of floral motifs with Kishandas’s timeless jewellery makes the collection even more exceptional. The Udaipur collection comprises of 6 different looks, each inspired from a different element of Udaipur with its own colour scheme and thus, a specific type of jewellery, to glorify the bride. 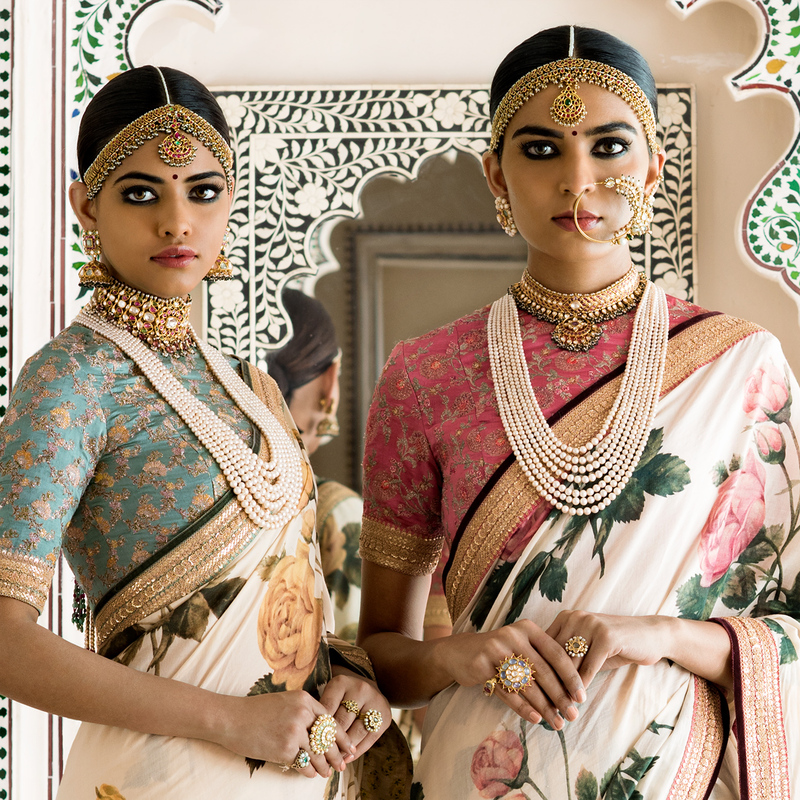 Necklaces are the highlight of this collection, where on one side the ‘Gulaal’ look showcases long pearls strings paired with chokers and large earstuds, with the typical Kishandas maathapatti and nath combination on white floral sarees; and the ‘Mharo Gulabi’, ‘Rani Saheba ke Pardesi Phool’ or the ‘Udaipur Lahenga’ looks focus on the deep plunging necklines paired with chokers that sit high on the neck and a few that even flare out in multi coloured versions. Embracing the colour of yellow gold, Sabyasachi has paired gold necklaces with shades reds, pinks, green and even all white ensembles. Long pearl and emerald strand necklaces for men also highlight the astute regalia of the look, when paired with sherwanis. 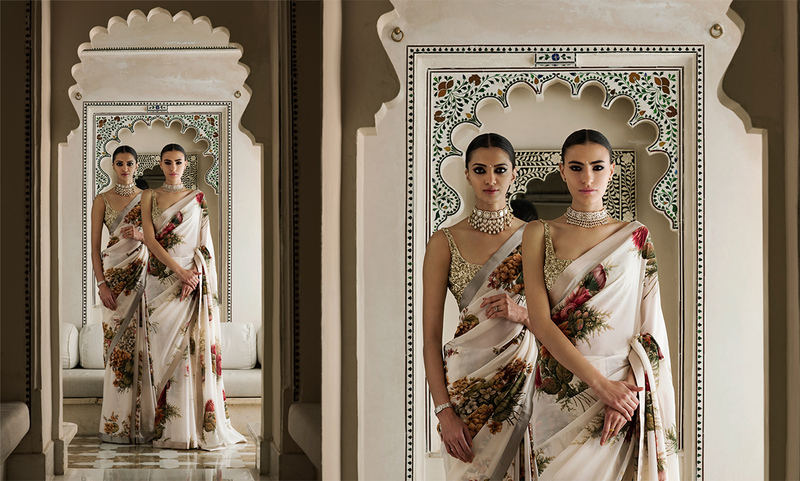 Each look reflects the history of the royal, noble and Mughal craftsmanship, embracing heirlooms with panache. Hints of European glamour of the 1920s and ‘30s can also be noticed in the diamond and emerald necklaces, influenced by classic jewellery of international jewellery houses of that time is reflected. Using numerous chokers in all sizes, it is noticeable that the choker has always stolen limelight and is a classic trend which always makes a comeback adding with a lot more innovation. The Udaipur Collection has been crafted especially for the 2017 wedding season. 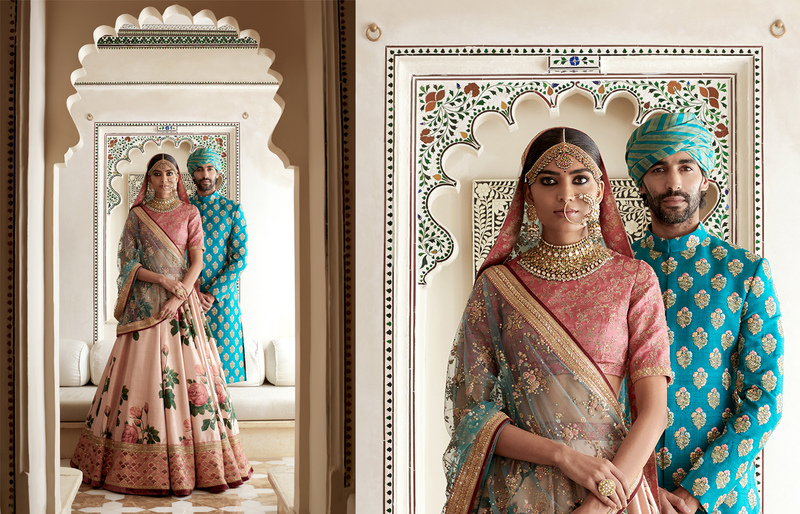 By adding the essence of the floral beauty and amalgamating it with the brilliance of eternal jewels, Sabyasachi and Kishandas & Co. have made them quintessential for an Indian wedding.